Total cost is around 20-30 rupeess(INR) or 0.6USD. heloo..,Arup da,protomoto tomake dhnono bad janai ei sb project amder sathe share korar jnno. “speaker” er watt & ohoms kto debo? ?r 6volt transformar jodi lagi…tha hole kno bujing problem hobe ki?plzz help me.. Ordinary 4″/4Ohm/5Watt speaker is fine. Use 6 volts supply, but use good quality filter circuit for ripple rejection. Hi,am in kenya n had no knowledge of electronics but am impressed by ur project s the IC available in kenya? hi! arup da how are you . Iam making this circuit. can I use a 9 v battery in this circuit. arup da how are you my 810 ic amplifier is give bad sound what can i do. use 7805 …totla hum free hoya jaba..kono extra noise thakba na..
Hi, I am making a Audio Door Phone. 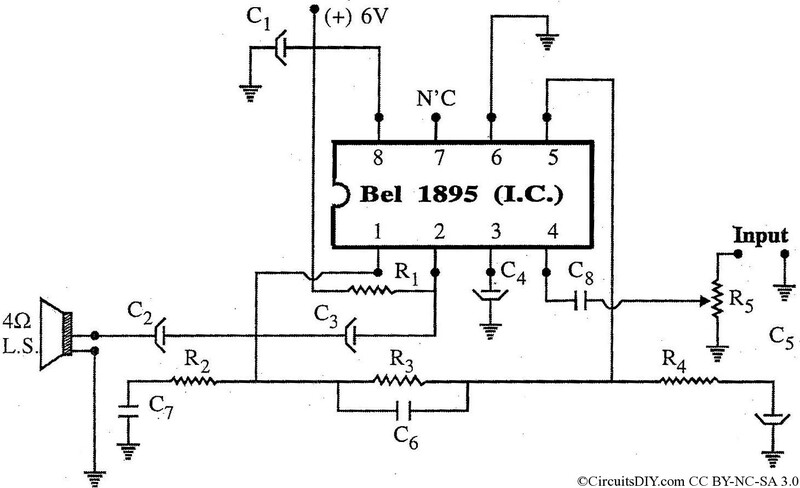 The circuit is based on a BEL 1895 audio amplifier IC. I couldn’t find BEL 1895 IC in the market. Which IC can I use instead of BEL 1895 IC? Please can anyone help me? I am also using UM66 IC in this circuit. The power supply is 9 volt. 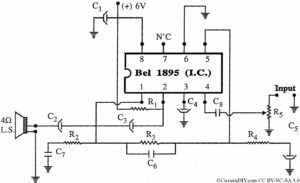 You cannot use any other IC as pin to pin replacement for BEL1895. Thanks Ramesh! I’ll try to get a 810 IC and test it. TBA810 is good audio I.C. I used it previously. Only drawback that it operates at 4-20V, typical 9 or 12V. I intend to use this amplifier for some specific purpose with power o/p of 5 watt rms for a classroom of 40/50 students.Is there any one who makes it in modular form? This may help me to avoid pcb making & assembling. Mr. Oak, if you need to just amplify your speech to your students, then I’ll humbly recommend you to use pre-built TDA2030A amplifiers. Of course it could be done in a modular and compact form on a piece on Vero board. I had built one about a year back with the TDA2003 IC, quite easily to build and powerful enough. Thanks for your reply. I intend to connect this module via a jack pin to the headphone socket of a miniature projector to amplify projector’s audio for a classroom of say 40/50 students. I am using this projector with an appropriately copied pen drive to teach lessons to primary students.In-built audio of the projector is understandably very weak & is meant for headphones. If TDA2030A amplifier serves the purpose,so it be! But let it be in modular form.I shall appreciate if you may kindly let me know the cost.Any other alternative? This is meant for charity work!! I may further add that we have chosen this combination of projector & pen drive in order to make it suitable for most of the areas of Maharashtra state, urban &/or rural having no grid power. In which case the whole system works on 5 volts supply, so that teacher can use mobile phone adapter for supply.The module should have input/output cables and a cable for d.c.supply from mobile adapter. Yes, TDA2030A based amplifiers comes in modular form, and it’s tiny. Please have a look here, http://amzn.to/2ycem7i . If you know someone who can make circuits, then you can build like this one just for 25 rupees. I used an unnecessarily large vero board, but it could be constructed in a much smaller form factor, just like a mid sized pendrive. I raised my query on 8th Oct ’17. I have not received any reply. I wonder whether you have received the same or not.Please let me know. If not received, I shall send it again. I apologize for being late to reply your comment. What is the charitable organization you’re working with? Thank you for your reply.It is a trust by name, ‘Bombay Community Public Trust’ (BCPT). They are involved in e-teach of std.I to std.V of primary schools in Maharashtra State & are covering many schools in Urban as well as Rural Maharashtra.For more detail information I may take this liberty to advise you to download their website: http://www.e-teachenglish.org. It is very good. I am sure you will like it.